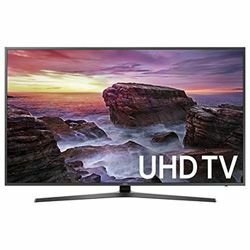 I decided to write a Samsung UN58MU6070FXZA review because this TV is really very good. First, the choice of this TV was influenced by its price. It is its main advantage. Secondly, for a little more than $ 500, you will get a full-fledged 4K ultra HD TV with support for HDR Pro and a set of all Smart TV features from Samsung. According to Samsung UN58MU6070FXZA specs, this TV does not indulge in a variety of functions. But since this TV belongs to the budget MU6070 series it makes the high-quality 4K picture available to everyone. Among the main features of this TV should be noted support for HRD Pro which helps to create a wider range of color and also enabling you to better distinguish between dark and light. Price (is about $500-$600). Very good price-quality ratio. Samsung Smart TV user-interface - one of the most comfortable user-interfaces for TV. Supports Motion Rate 120 technology, helps to create smooth action on fast-moving content with.